Nonrotation Of Midgut Loop - A Rare Cause Of Recurrent Intestinal Obstruction In Adults: Case Report And Review Of Literature. P Saxena. Nonrotation Of Midgut Loop - A Rare Cause Of Recurrent Intestinal Obstruction In Adults: Case Report And Review Of Literature.. The Internet Journal of Surgery. 2009 Volume 26 Number 1. Rotational abnormalities are a well-known cause of obstruction in neonates and children and may present as midgut volvulus. This is very infrequently seen in the adults and may present as vague intermittent abdominal pain or sometimes acutely as upper GI obstruction or ileocecal volvulus with strangulation or gangrene. We present a case of nonrotation of midgut loop in an adult female who presented with recurrent abdominal pain, vomiting and features suggestive of intestinal obstruction. Abnormal rotation with deficient fixation of gut predisposes the patient to cecal volvulus with threat of strangulation of bowels and all its dreaded complications. The diagnosis of malrotation and volvulus should always be kept in mind when evaluating adult patients with symptoms of vomiting and pain, even when clinical findings are featureless, diarrhea is present, or even with normal abdominal radiographs. Surgical intervention is mandatory to avoid or reverse ischemic insult and Ladd’s procedure remains the accepted procedure. The purpose of this description is to recall the pathogenesis and the surgical implications of intestinal non-rotation in adults and to review the literature. A 22-year-old female presented in emergency with complains of intermittent cramping abdominal pain and bilious vomiting for 2 days. There was a past history of recurrent vomiting with pain in the abdomen since childhood. On examination, the patient was average built, with a weight of 42 kg, a pulse rate of 96/ min, and a blood pressure of 100/70 mm of mercury. The abdomen was scaphoid, soft and bowel sounds were normal, and she showed no peritoneal signs. Laboratory investigations were within normal limits and abdominal x-ray [figure1] did not reveal any features of obstruction. The patient did not show any improvement after 48 hours of conservative treatment and was explored. 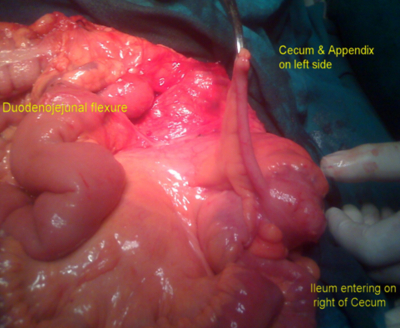 Intraoperative findings: The cecum and appendix were on the left side of the abdomen and the duodenojejunal flexure was on the right side [figure2]. There was a narrow jejunocolic isthmus held with a band of fibro-fatty tissue across it. The peritoneal attachments of the cecum passed anteriorly and laterally to the duodenum. The ascending and transverse colon spread across to the right side of the upper abdomen and returned back to the left towards the splenic flexure. Fortunately there was no evidence of strangulation or gangrene. A diagnosis of non-rotation of the midgut loop was made and Ladd’s procedure was done. The cecum was separated from the jejunum completely to widen the jejunocolic isthmus [figure 3]. 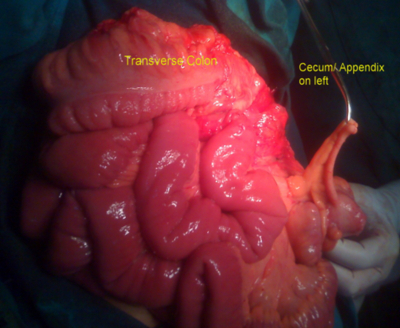 Ascending colon and transverse colon were freed and the cecum was brought low on to the left side. All the small intestine loops were placed on the right side of the abdomen and appendicectomy was done. The patient improved postoperatively and tolerated oral feeds well. She was discharged on the eighth postoperative day and was asymptomatic on subsequent follow-ups. During gestation the midgut grows so rapidly that the intraembryonic coelom is too small to accommodate it. So the midgut with its superior mesenteric artery is extruded into the extra-embryonic coelom in the umbilical cord, forming a temporary physiological umbilical hernia. When the midgut returns back to the intraembronic coelom, rotation of the midgut loop takes place through 270° in anticlockwise direction in three stages. In the first stage [fifth to tenth week] the growth of the right lobe of the liver carries this organ downward and to the right, taking the left umbilical vein [ligamentum teres] with it. This pulls the prearterial segment of the midgut loop down and to the right. So in effect, the midgut loop rotates through 90° in anticlockwise direction. Normally, in the second stage of rotation [at the tenth to eleventh week of gestation] the midgut loop returns to the abdominal cavity from the umbilical cord. The prearterial part, i.e. the small gut, returns first while the superior mesenteric artery is fixed to the umbilicus. Because the space in the abdomen is limited, the returning coils of intestines are pushed to the left underneath the superior mesenteric artery. The last coils of ileum reduce later and carry the superior mesenteric artery with it as it is reduced. The cecum and right colon reduces next and passes anterior to the right of the superior mesenteric artery. The subsequent growth and elongation of colon pushes the cecum into the right iliac fossa. In the third stage of rotation [eleventh week to shortly after birth] the gut becomes fixed to the posterior abdominal wall. Arrest of development at any stage changes anatomical placement of organs and also narrows the mesenteric base and impairs fixation, leaving the bowel at high risk for volvulus. Arrest of the first phase leaves the bowel herniated into the umbilical cord, creating omphalocele. Arrest during the second phase may result in nonrotation, incomplete rotation, hyperrotation, or reversed rotation. Moreover, gastroschisis and diaphragmatic hernias and mesocolic paraduodenal hernias also occur during the late second phase of rotation. Failure of the third phase results in a mobile cecum, unattached duodenum, or unattached small bowel mesentery, which makes it vulnerable to cecal volvulus and internal hernias . 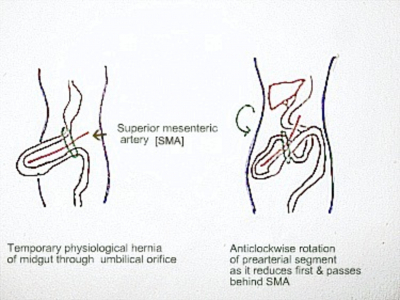 Nonrotation is the most common rotational abnormality and is due to failure of normal counterclockwise rotation of the prearterial segment of the small gut around the superior mesenteric artery. In nonrotation of midgut loop, the umbilical ring is lax. So the colon and cecum reduce first. 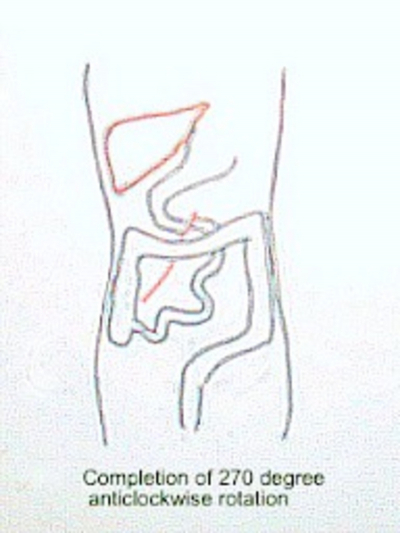 The small gut follows and displaces the colon and superior mesenteric artery to the left. So the small gut lies on the right side, the terminal ileum crosses the midline to meet the cecum and enters on its right instead of left side. The colon is confined mainly to the left side of the abdomen. The whole midgut loop may be suspended in the abdominal cavity by an extremely narrow pedicle, the dudenocolic isthmus thus making it vulnerable for volvulus. Bands fixing the cecum to the lateral abdominal wall develop abnormally crossing the duodenum [Ladd’s band] and have potential for duodenal obstruction. In both nonrotation and incomplete rotation, cecal bands may cause obstruction and ischemia before birth, leading to congenital duodenal atresia or stenosis. Therefore, patency of the duodenum should be checked routinely during corrective surgery . Incomplete rotation is the next most common abnormality and involves arrest of rotation at or near 180°. Thus the cecum lies in the right hypochondrium or in the upper abdomen. 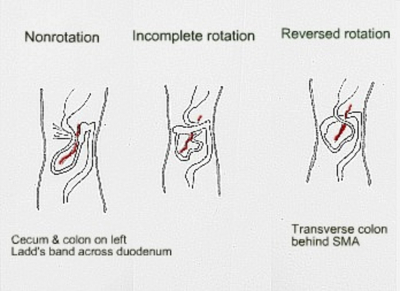 Reversed rotation results in a 90° clockwise rotation of the gut. The cecum and ascending colon reduce first, so the transverse colon goes behind the superior mesenteric artery and the duodenum comes anterior to the artery. In such cases the superior mesenteric artery may obstruct the transverse colon. The term malrotation is used to imply irregular and mixed defects of rotation. The true incidence of malrotation is unknown, since many asymptomatic patients fail to present. Rotational abnormalities are often associated with other congenital abnormalities like congenital abdominal wall defects, polysplenia or asplenia . The surgeon exploring such patients should diligently look for associated congenital abnormalities. Abnormal rotation with deficient fixation of gut predisposes the patient to volvulus of the ileocecal segment resulting in intestinal obstruction. Sequelae include ischemia, mucosal necrosis, intramural air formation, gram-negative sepsis, perforation, peritonitis, and death. Midgut volvulus can occur at any age though it more commonly presents in the first few weeks of life. Volvulus presents with irritability with bilious vomiting and later on bloody stools and eventually collapse due to intestinal ischemia. Chronic duodenal obstruction due to Ladd’s band may manifest as intermittent vomiting. Anomalies of intestinal rotation are most often asymptomatic and are often incidental findings in adults. Nonrotation occurs in approximately 1 in 500 live births . Most patients present in emergency with cramping generalized abdominal pain and vomiting. So most cases of nonrotation in adults are detected at emergency laparotomy for intestinal obstruction due to midgut or ileocecal volvulus . Some patients may give prior history of recurrent vague abdominal pain with bilious vomiting suggestive of intermittent small intestinal obstruction or volvulus. Stooling pattern varies and diarrhea is recorded in 16% . In few cases nonrotation has been noted as an accompanying finding at laparotomy for another condition. In the acute symptomatic patient, only emergency laparotomy can provide the correct diagnosis and decrease the risk of bowel gangrene. In the chronic situation, barium studies of the upper and lower gastrointestinal tract may reveal findings suggestive of midgut nonrotation or malrotation. Duodenal obstruction causes gastric and duodenal distension with a prominent duodenal bulb and air-fluid level. 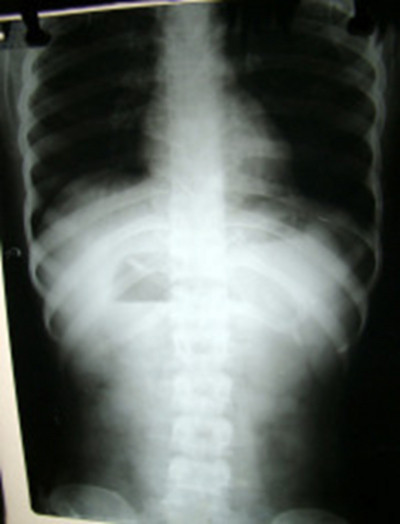 This double-bubble is the classic sign on abdominal radiography. There is relative paucity of gas in the lower abdomen. In older patients, the double bubble may be absent in the asymptomatic phase. The diagnosis may be made by upper GI contrast studies in intermittently symptomatic patients. The duodenum may be distended and may have an abnormal shape. The duodenojejunal junction may be on the right and the cecum may be on the left. The duodenum may show a corkscrew effect suggesting partial volvulus. The small intestines may be entirely in the right side of the abdomen. Barium enema may show a displaced cecum with the ileum entering the cecum from the right. Ultrasound and computed tomography scan of the patient's abdomen showing the superior mesenteric vein located on the left of the superior mesenteric artery suggest nonrotation of the intestine but are not sufficiently accurate to confidently exclude malrotation or volvulus. The CT whirl or whirlpool sign portrays the swirling appearance of bowel and mesentery twisted around the superior mesenteric artery axis. [a] Volvulus occurs clockwise, so it is untwisted counterclockwise. With extensive gangrene a second look laparotomy may be done after untwisting the volvulus. Division of abnormal peritoneal bands (duodenocolic, duodenojejunal, ileocolic) . The bands between the cecum, terminal ileum and duodenum are sharply divided. This brings the straightened duodenum and small intestine on the right side and the cecum on the left side thus widening the narrow duodenocolic isthmus and relieving any duodenal obstruction. 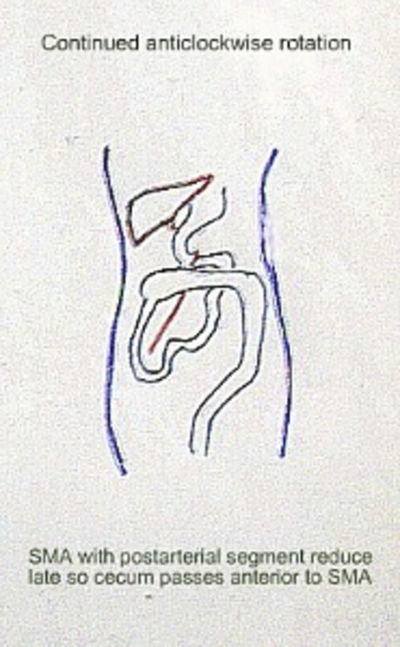 Ladd bands, which constrict the duodenum, are also thoroughly divided, using a Kocher maneuver to ensure release of obstruction. [c] The appendix is removed to avoid diagnostic errors in later life. [d] Closing of mesocolic defect to prevent future internal hernias. Laparoscopic Ladd’s procedure has also been effectively performed when there is no obstruction or volvulus. The minimally invasive approach has the advantage of early oral intake, early discharge, better cosmetic results and probably less postoperative adhesions . Causes of postoperative morbidity are adhesive obstruction, short-bowel syndrome, and recurrent volvulus. Volvulus may recur after the Ladd procedure in 7% of cases. To prevent recurrent volvulus several techniques for fixation of the cecum and duodenum were tried; however, overall statistics have not shown improvement in outcome . Bill and Grauman proposed fixation of the cecum to the left lateral wall and of the small bowel to the right paracolic gutter. Fitzgerald described lysis of duodenal adhesions and mobilization of ascending colon and cecum to the right paracolic gutter with suture fixation in order to restore normal anatomy . Gohl and Demeester added formation of a new retroperitoneal bed to promote fixation of ascending colon and small bowel mesentery. Clinical awareness of malrotation and associated anomalies, increased sensitivity to clinical symptoms and better imaging studies have led to improved diagnosis, allowing for prompt treatment of malrotation before life-threatening complications occur. The risk of mortality increases in the presence of bowel gangrene and is influenced largely by the length of viable bowel left. The risk of mortality also increases with the presence of associated serious congenital abnormalities . Asymptomatic older patients with intestinal malrotation may be managed conservatively but they should be warned that volvulus can occur at any time and they should report early if symptoms occur. In conclusion, adult presentation of intestinal malrotation is a rare condition and difficult to diagnose. These patients often present with chronic abdominal pain and vomiting with or without signs of intestinal obstruction or strangulation. Diagnosis requires a high index of suspicion. Midgut volvulus can occur at any age, so the diagnosis of malrotation and volvulus should always be kept in mind when evaluating adult patients with symptoms of vomiting and pain. Surgical intervention is mandatory to avoid or reverse ischemic insult and Ladd’s procedure remains the accepted procedure. 1. McGregor L: The Rotation of Gut - Synopsis of Surgical Anatomy, twelfth edition, 1986; pp. 22-30. 2. Hebra A, Miller M: Intestinal Volvulus, eMedicine: emedicine.medscape.com Updated: Mar 26, 2010. 3. Papaziogas B, Patsas A, Paraskevas G, Tsiaousis P, Koutelidakis I, Christoforakis C, Atmatzidis K: Adult intestinal malrotation: a case report. The Internet Journal of Surgery; 2009; Volume 19, Number 2. 4. Gohl ML, DeMeester TR: Midgut nonrotation in adults. An aggressive approach. Am J Surg; 1975; 129 (3): 319-323. 5. Millar AJ, Rode H, Cywes S: Malrotation and volvulus in infancy and childhood. Semin Pediatr Surg; 2003; 12 (4): 229-236. 6. Bajwa A, Sheth H, Hughes F: Midgut malrotation as a rare cause of chronic abdominal pain: a case report and review of literature. Grand Rounds; 2007; 7: 67-69.